The most basic shape for a hanging light is a simple cylinder or drum. Shown here are three variations on the cylinder; the first two have a very gentle angle; the one on the far right has a unique overlapping design and angled cut on the bottom. 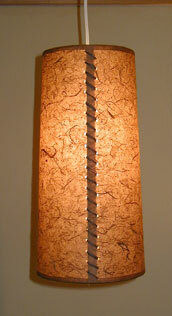 A cylinder shade, like a table lamp shade, will have a seam. By using lacing along the seam as in the image at the left, the seam becomes a part of the design. On the far right, the seam is the focal point of the design, accented with a small brass ball. Otherwise, the seam can simply be positioned against a wall. Since there are limitless options in terms of sizes, shapes, paper, singles vs. multiple configurations, etc., it's best to email me directly with your design ideas and questions and to discuss pricing, which starts around $120 for a simple cylinder, including ceiling plate and cord.